Clarify. We work with leadership teams, to understand and articulate their organisation’s purpose, objectives and value. Together, we get to the heart of what the team wants the business to achieve and agree the most effective way to communicate it. “DB&Co worked with us to develop a brand identity for a new private equity backed buy and build business set up to provide software and data solutions to the global shipping market. The brief demanded something fresh, with a sense of momentum and a nod to the global nature of the company’s target markets and solutions. The DB&Co team helped us firstly to articulate what it was that was going to make this new entrant special in the markets it served and then to bring that to life with a strong brand expression and clear brand story. The DB&Co team has a refreshingly practical approach to brand that includes a strong focus on establishing clear points of difference that enable brands to stand out from the crowd and engage in a more meaningful and effective way with audiences. 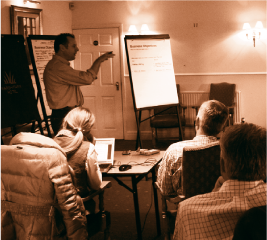 David’s ability to distil what he has heard in over 20 hours of workshops into a creative interpretation is unique and impressive – not something I have ever seen before in over 15 years of working with listed company reports. 100% of the team said it was enjoyable (25%) or very enjoyable (75%) – Phew! “For us, the help has been in your creative messaging…..using images to relate key concepts. The output was agreed communication and language that we can use to communicate to our customers what exactly we are offering and why they should use our company rather than our competitors. He helped us identify our point of difference and recognise our strengths and weaknesses and put plans in place to address these. You are a first rate workshop leader. Your messaging workshop process is superb – probably better than you realise. Particularly because it encourages consensus – something rarely found in large corporations – IMHO. “We have worked closely with DB&Co for over ten years, using Message Mapping as a powerful diagnostic tool. “Whilst we commissioned DB&Co as a direct result of needing to address our market positioning and subsequent messaging, the real value derived was in linking this to our visual identity and the ways in which this should change in order to present a complete picture of the company. The structure of all the initial message mapping workshops was critical in developing and delivering a sustainable market position based upon a framework of desired perceptions and different articulations of propositions to get our audiences aligned with these. Once developed, the framework then went on to serve as the foundation for everything that we did in Marketing from advertisements and e-marketing to our presence at exhibitions and corporate communications. It became a central reference point. What makes us different? What perception do we want to create? 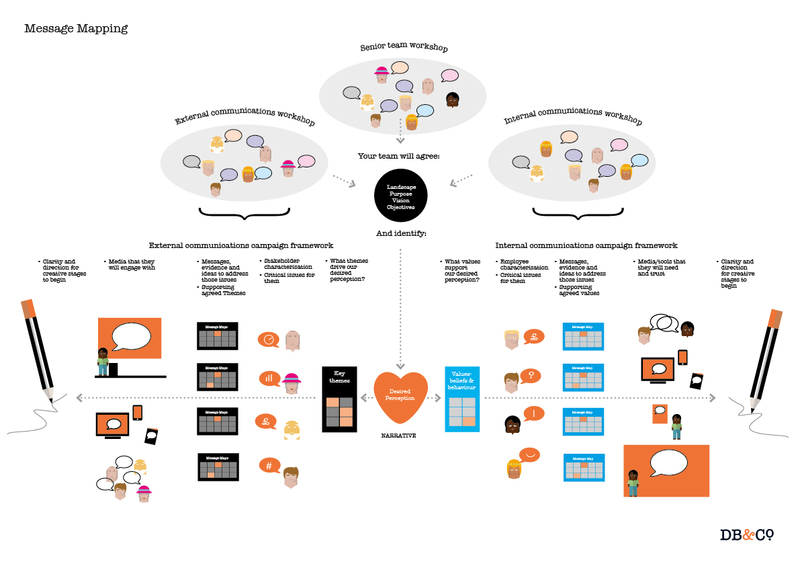 Message Mapping provides a pragmatic and effective framework by which these questions can be asked, answered, challenged and a consensus on the way forward and agreed underpinning a future communications strategy. Clear on what makes you special? Helped us agree key audiences and the messages that differentiate us from competitors. As a result, we have been able to move forward as a joined up team. Colleagues aligned & contributing ? I was entirely comfortable and often encouraged getting DB&Co in front of internal stakeholders. They were able to challenge and prompt them in a way that was difficult for us to achieve. Clear on what your customers really want? Our message mapping work has created tangible benefits for the organisation within a matter of weeks. Our work with David has provided us with a wonderful foundation on which to base our future communications. His style, approach and message mapping process has proven invaluable, giving us highly effective results. Message Mapping© has been used very successfully for brand and product proposition development, investor reporting and communication planning. Involving a mix of at least five to a maximum of around 15 contributing individuals who work at a senior level, with responsibilities covering policy making, operational performance and marketing communication. The workshops can be undertaken as a single one day session or broken down into smaller components. Our strategic consultant, David Birt, facilitates the workshops. He has over 25 years’ experience leading diverse and challenging design and communications projects. This is presented as a report which pulls together the outcomes from the above workshops. It provides a clear and measurable communication brief, capable of connecting a brand to high priority audience groups in order to build interest, revenue, loyalty and advocacy.